Minimum System Requirements: OS: Windows Vista/XP, Processor: 2Ghz Pentium 4 or better, Memory: 1GB or more, Video Card: nVidia GeForce 66000/ATI Radeon X1650 w/256MB RAM or better, 5GB Hard Disk Space. 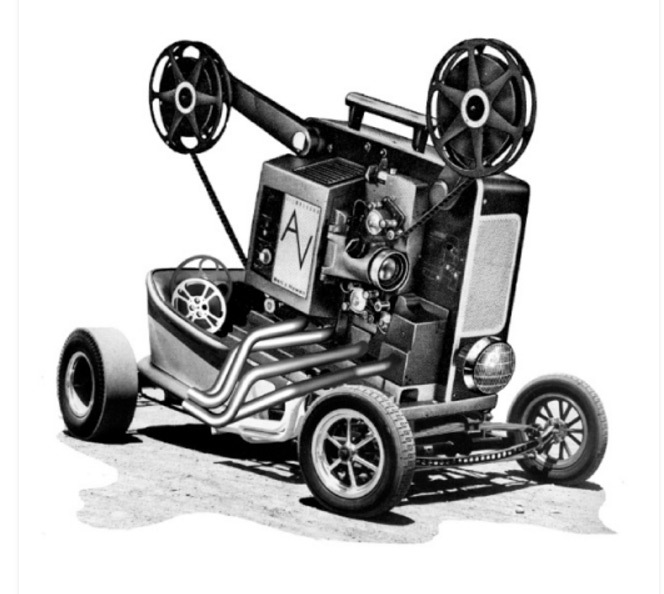 As genres progress, someone will eventually create the hot new product that completely reinvents or refines the genre in such a way that no player will be interested in anything done by the old standards, and games that would have emulated the old product will not emulate the newer game simply because they must in order to be worth owning. First we emulate 7th Guest, then Resident Evil, and now Resident Evil 4. 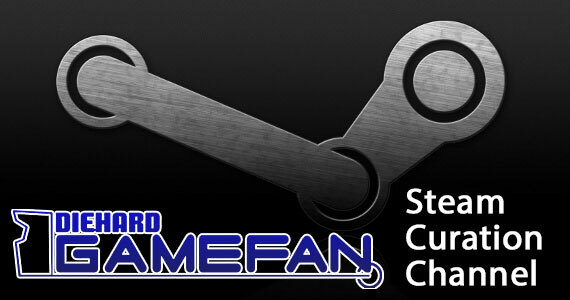 First it’s Wolfenstein 3D, then Doom, then Quake, then Half-Life. You get the idea. And so it is with the “dungeon hack”Â, AKA “games that play like Diablo“Â: after years of being provided with games that seek to emulate Diablo and its sequel, we received Titan’s Quest, and after the success of that product, we now have one of the first Titan’s Quest emulation attempts in Legend: Hand of God. Now, don’t misunderstand that assertion: by and large, most games are derivative from other games in some respect, so there’s no shame in this. Frankly, Legend is not at all ashamed of what it is, and for that it should be commended. 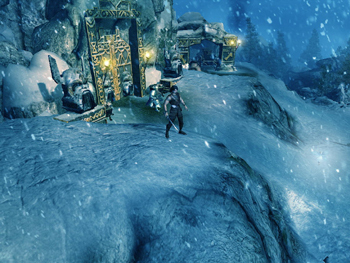 Unlike a game like Silverfall, which dressed itself up in all sorts of technological advancements, statistical modifications and gameplay changes to hide the fact that it was such a product only to fail because all of its changes ended up making the experience undesirable, Legend revels in what it is, and the experience is better for it. It is, for better or worse, a game where you travel the world obliterating everything you see to level up, build up skills, accumulate loot, and equip your character to the point where you could obliterate the final boss on sight, all to do it over again on higher difficulty levels. It is proud of this fact, and because of this, it is actually quite enjoyable all in all… if not perfect. The story in Legend centers around a young man by the name of Targon, his ally Luna, and the fate of the entire world, as one would expect from the get-go. As the story goes, some time ago, there was a huge war with the demon warriors of the Shadow, which was eventually resolved by way of creating The Holy Flame, a flame meant to burn forever to ward off the demons and ensure they would never return. Well, this doesn’t happen, of course, as the flame is extinguished, the demons return and kill a bunch of people, and our hero Targon is instructed to retrieve the legendary Hand of God, an amulet that is said to contain the power to seal away the demons for eternity, but is so powerful that it needed to be sealed away lest it unmake the world and all that jazz. Generally, the story is acceptable enough, in that it gives you your objectives and moves things along neatly enough, and is largely tolerable in most respects. Mostly, it’s nothing special, but it’s not terribly bad or anything and it does its job fine. One thing Legend certainly has in its favor is its visuals, as they’re quite nice; Targon and his foes are animated well, pleasant to look at, and generally reflect battle damage as they fight and respond as one would expect in combat. 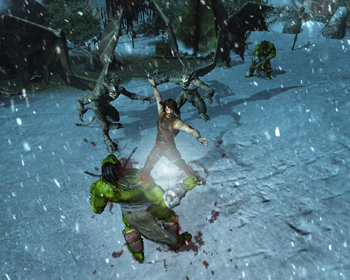 Many games of this sort simply show units hacking one another to death ad infinitum, but in Legend, characters will stagger, fall over, dodge around, and visibly parry attacks, bringing a surprisingly large amount of life to the millions of battles you’ll fight over the course of the game. The environments are also quite nice to look at when displayed at maximum quality, with grass and flowers gently swaying in the breeze and the various simple stylistic touches that make up the fantasy world here and there adding to the visual aesthetics of the experience, like the old-style graves and statues and the odd monster villages and such. The music is also quite nice, featuring solid combat music and hauntingly effective Enya-like tracks while you wander about towns and such, and the various sound effects are mostly solid in and out of battle, if a bit odd at times (the sounds of metal on metal don’t work so well when one is attacking an unarmored opponent, for example). The voice acting isn’t particularly good, however; the voicework from the various NPC’s you encounter varies between good and bad depending on the character, but the voice work of Targon and Luna are generally not particularly good, with Targon’s lines often falling flat in delivery and Luna’s voice actress apparently having apparently studied at the “Navi School of How to Annoy the Player With Only the Sound of Your Voice”Â voice acting academy (as all of her dialogue is outright painful to listen to). Now, if you’ve played one dungeon hack, you’ve played the vast majority of them, but if you’ve somehow managed to avoid the genre altogether, here’s the gist of the gameplay: the left mouse button pretty much does everything. Hold it down over nothing to move, click on an NPC with it to talk to them, click on a treasure box with it to open the box, and hold it down on an enemy to attack them. That’s how you play most of these games, and as such, Legend does exactly what you would expect of it and does it well. As you move from location to location you’ll run into various monsters and NPC’s, with the former wanting to do you in and the latter wanting you to do something for them. NPC’s will either offer you quests that are meant to advance the main plot or are part of their own self-contained storyline, but most quests are generally pretty easy to understand, IE “kill this”Â or “collect this”Â or “save this”Â or what have you. With monsters, the situation is much simpler, as they really only respond to being slain with whatever weaponry or magical abilities you have at your disposal, which makes them easier to deal with if nothing else. Now, part of the fun of these sorts of games, aside from slaying monsters, is building up your characters into killing machines, and in Legend, everything stems from the Path system. At the beginning of the game you are allowed to choose two paths which will influence your character for the remainder of the game. You’re given a pool of five paths to choose from (Warrior, Villain, Magic, Wilderness, and Faith), and depending upon which two you choose, this will dictate what skills you have access to, what stats you should level up, and what equipment you can put on, as well as how you will play the character. Making a character who is a Warrior/Villain means the character will be exceptional in melee combat, while a Warrior/Faith character will act like a Paladin (with damage dealing and healing at their disposal) and so on. 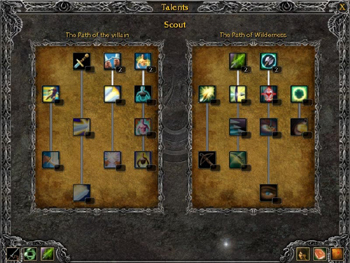 Each Path has several skills that you can commit points into (one per Path per experience level), which allows you to choose the skills that seem most appropriate to your play style (IE choosing to make a Warrior/Villain and specialize in dual-wield and swords, or shields and axes, or whatever). You’re also given three points per level to dump into your four attributes (Strength, Dexterity, Constitution, and Intelligence), to build the character that will be most useful to you based on your Paths. The various equipment pieces in the game are also mostly Path-specific, meaning that you can’t equip Crowns or Rings if you’re not a Magic of Faith character, while heavy armor and shields are useless if you’re not a Warrior, which adds another layer of depth to your Path choices. Do you want to deal melee or ranged damage? Do you want to heal or cast damage spells? You’ll have to figure out these things before you start playing, so as to maximize your skills, which helps to add longevity to the experience (IE “Let’s try going through the game as a Wilderness/Magic class this time…”Â). Legend does a few other novel things that make it worthwhile beyond the combat mechanics. For one, Luna, your Light Elf (fairy, basically) companion not only acts as an odd source of annoying commentary, she’s also your pointer. This isn’t particularly exciting under normal circumstances (it just means your pointer looks like a fairy) until you begin traversing dungeons, where Luna’s use becomes revealed: she can light up wherever you place the pointer, thus acting as a free-moving flashlight to allow you to look around in dark places, which is certainly different and works nicely. 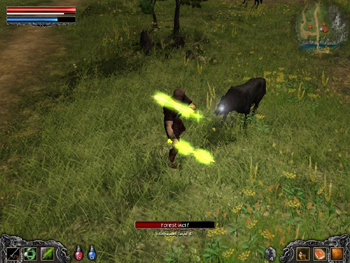 Also, while the game defaults the mouse clicks to three specific actions (the left mouse button moves you around and attacks, the right mouse button attacks from a stationary position, and the center button allows you to rotate the camera), you can change the functions of these three buttons at any time, meaning you can have magic spells or special attacks on any of your command palette buttons. You can also build multiple command palettes which can be cycled through with the number keys (for those who are used to these being the potion hotkeys in other games, these are hotkeyed to Enter for mana and Space for health potions), meaning you can have different palettes set up for different occasions. You’re also offered various Runestones throughout the game world that allow you to teleport around, much like in Titan’s Quest, and these serve as relocation points if you die as well as easy ways to teleport from place to place. They also act as your checkpoint if you save and exit, so you can restart play from the last Runestone you touched. Aside from the variations in Path selection, Legend also offers three difficulty levels to play through (with each unlocking after you’ve completed the prior level) to give you the ability to further level your character up and such. The core game will probably take you around forty to fifty hours to play through, depending on how you play, which gives you plenty of play time to go through, and if you want to play through the higher difficulties, you could spend as much as one hundred and fifty hours playing, which means some insane replay value. That all said, Legend has a few significant problems to it that make it difficult to recommend to newcomers and fans of the genre alike. For one, the game locks you to a specific character with a default name and gender, which goes against the way most of these sorts of games tend to do things, as frankly, players often want to have COMPLETE customization control over their character, which this eschews for plot purposes. This would be fine, except that, well, this isn’t the sort of game that benefits from such a mechanic, which limits the appeal a bit. For another, there’s no multiplayer component at all. None. Again, as these sorts of games tend to feature online multiplayer components as their major source of long-term replay value, the fact that Legend is effectively a solo experience exclusively further limits its appeal significantly. There are also considerable loading times when going from area to area, which wouldn’t be bad if you were actually changing areas, but instead the game will simply stop responding for a few seconds while it loads the new location, which is incredibly disconcerting the first time it happens and mildly annoying every time thereafter. The big problem, though, comes from the fact that the game is buggy. Without the bugs in the product, the game would be fairly easy to recommend even so for a player who was looking for more dungeon hack action, but with them, the game can often end up being generally messy and unfriendly in a lot of respects. Some bugs are simply confusing or annoying, like the various text bugs that pop up (IE Targon making the observation that he needs the key to the cemetery when you try to buy something from an early-game shopkeeper, or a quest NPC going through about five minutes of spoken dialogue while her text bubble contains, maybe, ten words), but these bugs aren’t game-breaking. However, a bug with the weapon palette switching mechanic (where you can assign two different sets of weapons to be used, which can be switched between at the press of a button) which basically makes your weapon a default crap sword, regardless of what it was to begin with (which lost me my Orcslayer when I discovered it, thanks guys) makes this mechanic completely unusable, which is, frankly, terrible. There’s also a wonderful bug that occasionally crashes the game out to the desktop when you try to switch items between your inventory bags, meaning that if this happens on the third floor of a four-floor dungeon, you’ll have to fight your way back down through the three floors you cleared (as I had to do). As the former bug has been documented by several players, and the latter bug happened to me three separate times while playing, I’d have to say that these are universal problems, meaning that they’ll be more than likely to pop up during your play session (and also meaning that, judging by the frequency of these bugs, the time spent play-testing the game was minimal). There are also a few exploitable tricks (infinite-killing bosses, for example) that can be game-breaking in the OTHER direction (IE can make the game way too easy and probably should have been removed before the game went gold. At this time, there’s no patch for the game, meaning that if you DO want to play through it, you’re going to have to fight past the bugs and ignore the exploitable actions to get to the fun of the game. 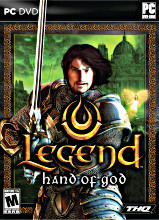 Assuming a patch comes from THQ/Master Creating sometime in the next few weeks, Legend: Hand of God is a generally entertaining dungeon hack that does what it does well enough to be worth checking out by fans, though it’s not as fantastic an experience as one might hope. 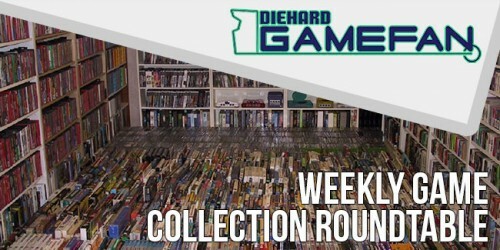 It looks and plays great, offers enough variety and replay options to keep most people entertained, and features some solid, interesting gameplay mechanics that make what could be a simple retread worth playing. That said, it’s not what the game offers that is as damning as what it does not, and without a truly customizable character or any sort of multiplayer component, Legend: Hand of God feels like less than a complete experience. 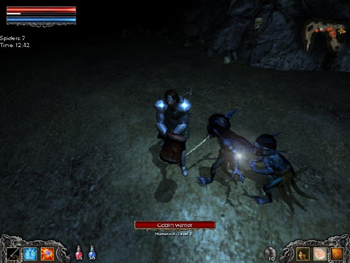 Even if you can look past that, at the moment, the bugs in the game make it somewhat less than enjoyable to play, as the bugs remove some core mechanics from the experience, and leave the player feeling as though they simply CANNOT do what they want with the game for fear of losing valuable goods or crashing their game entirely. If a patch resolves these issues, and you’re not interested in online play or can live without it, you’ll find Legend: Hand of God to be a fairly worthwhile purchase, as it’s slightly cheaper than your typical game in the genre, and it should keep your interest until Diablo 3 comes out. If you’re looking for another dungeon hack to plow through, or you’re fairly new to the genre, Legend: Hand of God isn’t a bad choice to pick up. It features solid, high quality visuals, powerful music, easy to learn gameplay mechanics, a fair amount of gameplay depth, plenty of replay options, and a good amount of first-playthrough depth to make it worth checking out for fans and newcomers alike. However, a lack of in-depth customization, a complete absence of an online component, a dearth of originality and some game-crippling bugs make the experience hard to recommend at this time. Assuming the bugs will eventually be rectified, Legend: Hand of God is worth checking out if you’re uninterested in online play or are just looking for something to fill your time until Diablo 3, but in the end, it doesn’t quite live up to the standard set by Titan’s Quest, the game it’s most obviously borrowing from.